Pacific hemlock parsley growing along shorelines. Photos by Kelly Fretwell (top, bottom right) and Georgia Brander (bottom left). Pacific hemlock parsley is perennial plant that grows to 1.2 m tall. It has a short and stout stem-base growing from a large tap root or a cluster of roots. The stem is hairless and solitary, and bears large egg- or diamond-shaped leaves. These leaves are divided pinnately 3 times into lobed or cleft leaflets, giving the leaves the overall appearance of fern-like fronds. 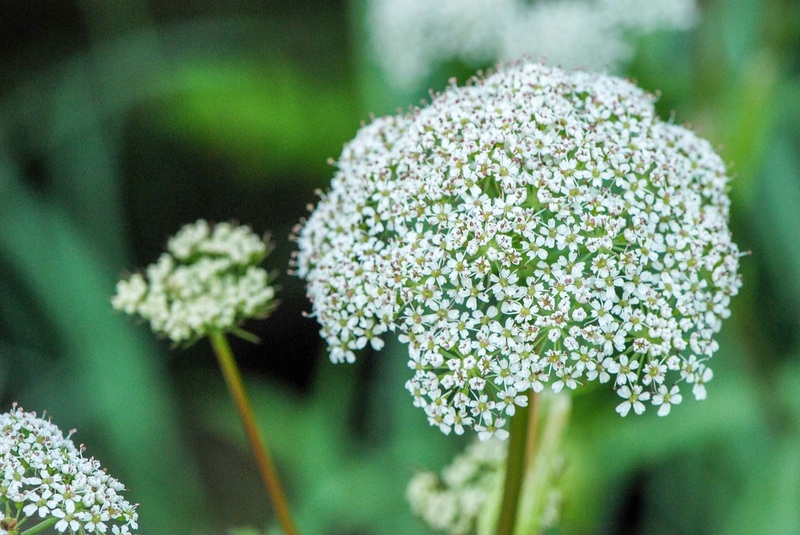 The flowers are white, small, and plentiful when blooming: 8-30 small heads densely group to form one or more large umbrella-like head (umbel). The small fruits are oblong and ribbed. Click here for more images of this species. Pacific hemlock parsley is mainly found along or near the coastline along gravelly beaches, sandy shores, grassy bluffs, tidal marshes, and sometimes bog woodlands. It is common along the Pacific Northwest coast from Alaska to California. 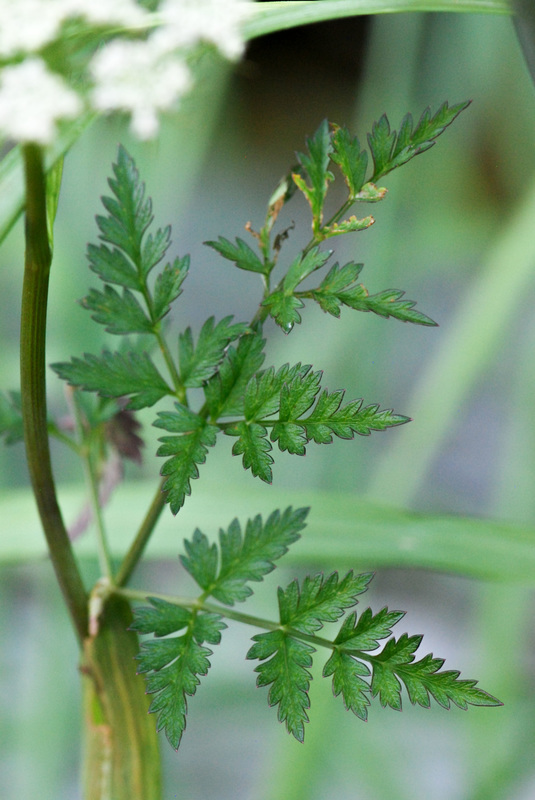 Pacific hemlock parsley can be confused Calder's lovage. 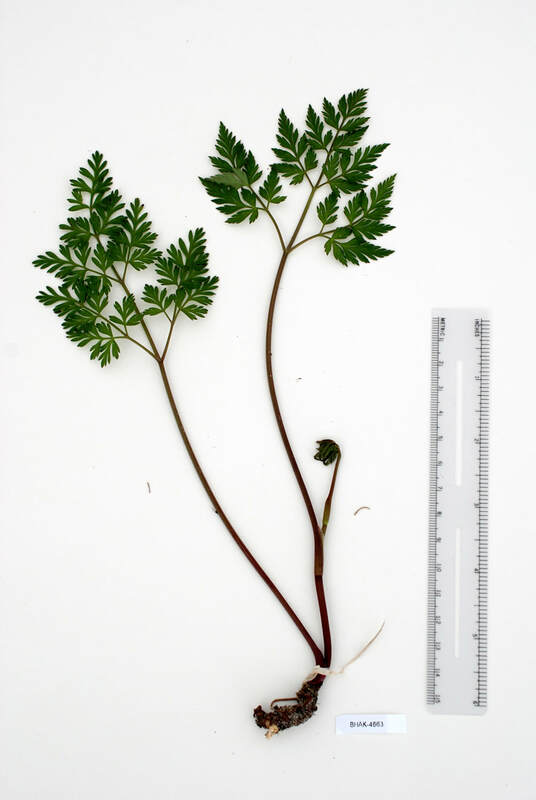 Calder's lovage has a distinctive root crown which is absent from Pacific hemlock parsley; its range is largely restricted to Haida Gwaii and northern Vancouver Island. A common nickname for Pacific hemlock parsley is 'wild carrot', as the roots can be pulled from the ground in spring and eaten and prepared in the same manner as carrots. 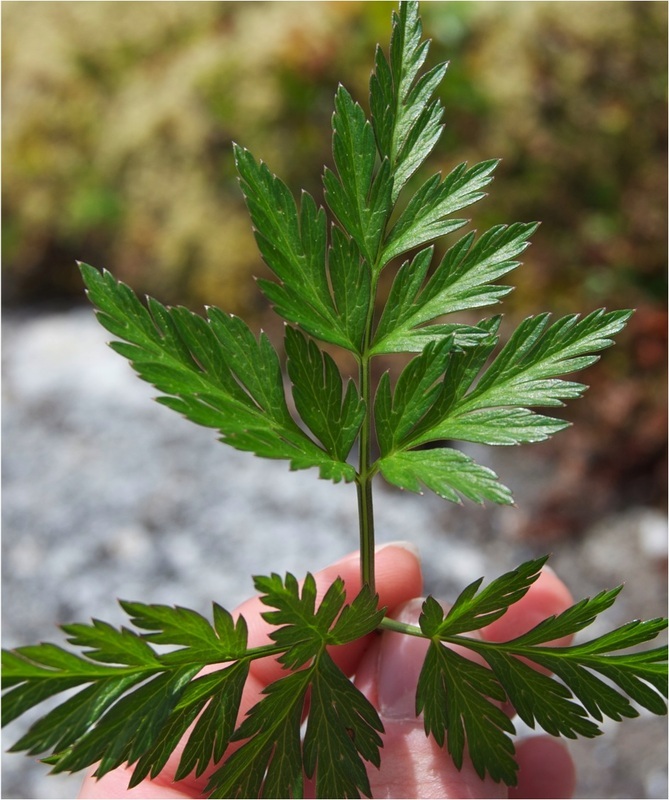 Pacific hemlock parsley is a traditional food source for the Kwakwaka'wakw, Nuxalk, Heiltsuk, Haisla, Oowekela, Sechelt, Halq'emeylem, Squamish, and other coastal First Nations. 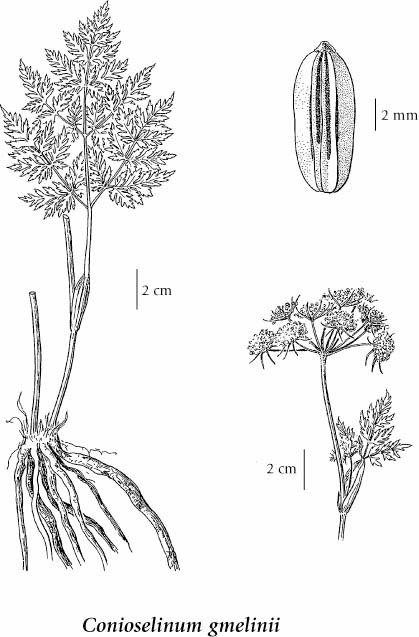 ​Note that some other members of the carrot family with similar flower structures (and sometimes leaves) are extrememly poisonous, including Douglas' water hemlock, Pacific water-parsley, and poison-hemlock. Pojar, J. and MacKinnon, A. (1994). Plants of Coastal British Columbia. Vancouver, BC: Lone Pine Publishing. P. 220. Conioselinum gmelinii (Cham. & Schltdl.) Steud. In Klinkenberg, Brian. (Ed.). E-Flora BC: Electronic Atlas of the Plants of British Columbia. Lab for Advanced Spatial Analysis, Department of Geography, University of British Columbia, Vancouver. Accessed 4/12/2014. Kelly Fretwell, Paige Whitehead, and Brian Starzomski (2014).